LH Photo: Lenny Baldwin, Turbine Maintenance Service Manager accepts an FAA AMT Award from Lou Homsher, Chief Inspector Turbine Maintenance and Dave Valenta. RH Photo: Don Champion accepts an FAA AMT Award for Banyan Air Service. (Left to right.) Lynn Juengel, Turbine Maintenance Manager, Don Champion, President, and Steve Ouellette, Chief Inspector Avionics. Pictured above are skilled Banyan Air Service Aircraft Maintenance Technicians that are rarely seen by the public but are none the less vital to the safe, airworthy condition of today's corporate aviation community. 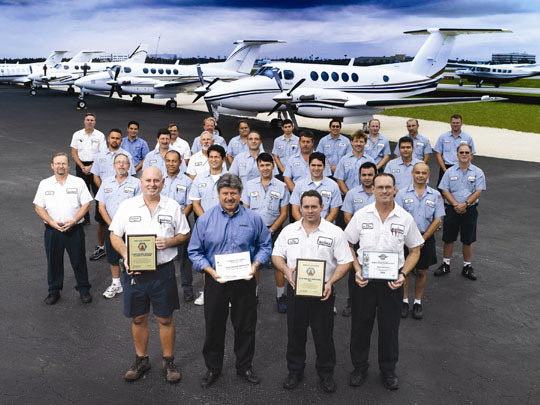 The knowledge, skill and integrity of these AMTs enable Banyan Air Service to provide comprehensive aircraft maintenance services, including heavy airframe maintenance and engine maintenance, structural repairs and modifications, avionics installations and support, interior refurbishment, exterior painting, parts sales and distribution. These skilled professionals specialize in King Air, Citation, Hawker and Lear inspections and modifications. These proud Aircraft Maintenance Technicians are part of a worldwide brotherhood of craftsmen that carry out their duties of inspecting, repairing, troubleshooting and caring for today's corporate fleet. To find men dedicated to a craft that was started over 100 years ago by Charles E. Taylor one only has to look at Banyan Air Service. These men are truly the "Faces Behind Safety".